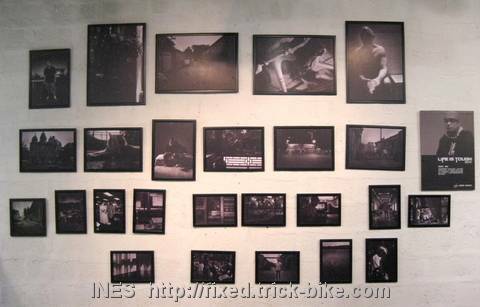 My fixed gear bike friend and photographer Nie Zheng had the opening of a photography exhibition today. 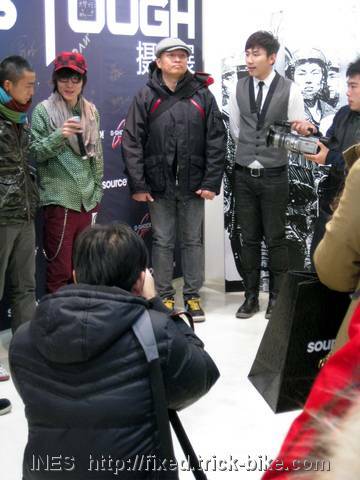 The exhibition was organized by Source. 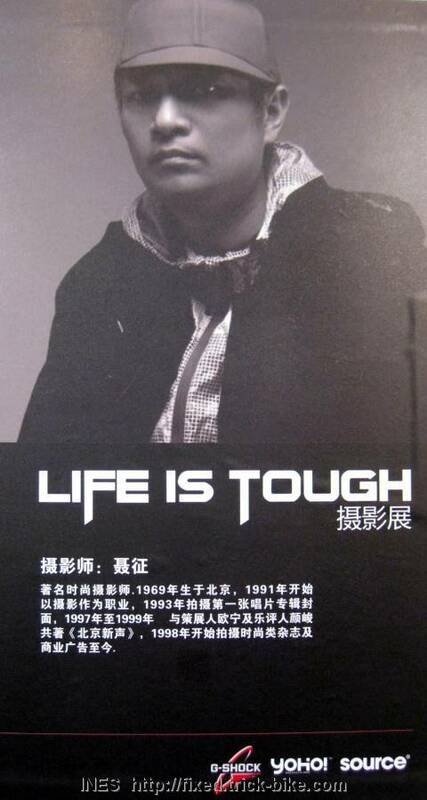 Nie Zheng had taken pictures over a period of 40 days of people in Beijing under the theme „Life is Tough“. Like a Chinese lady working very hard in a magazine as an editor for over 7 years, a Japanese guy opening an Italian restaurant, Taiwanese opening a Taiwanese snack bar in Beijing, old Chiense people doing the early morning exercise in the Temple of Heaven, a stray cat, a Japanese guy that has a barber shop in Beijing and has been cutting hair for over 11 years every day for 12 hours, Chinese street construction workers. I am a foreigner in Beijing who was a competitive athlete for 20 years and opened a bicycle shop in the traditional heart of the capital of the Bicycle Kingdom. So he had also taken a a picture of me riding my huge 36 inch unicycle the day we had put together the tall bike. 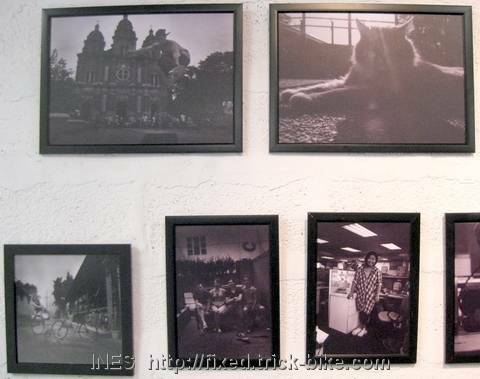 That picture is on the bottom left side of this picture and he had given me a print that I will hang in my bike shop. He invited me to come over before this exhibition opening when the media and press were there for a short interview. 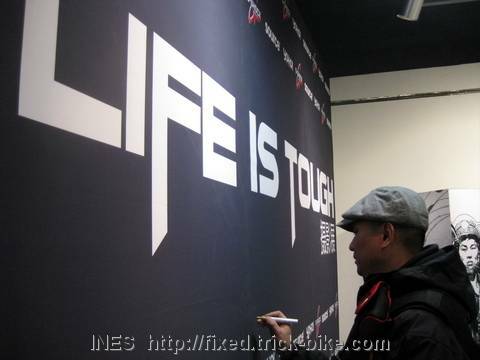 Nie Zheng was then requested to sign the huge wall. We then went for a huge and delicious dinner and came back to Source just for the official opening of the exhibition to the public. 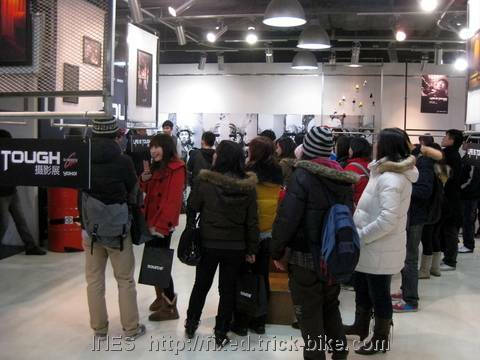 This entry was posted on Freitag, Dezember 18th, 2009 at 22:18 and is filed under Beijing, China, Fixed Gear, Media. You can follow any responses to this entry through the RSS 2.0 feed. Both comments and pings are currently closed.